We’re only 6 weeks away from making history at what is expected to be the biggest climate march ever – the People’s Climate March NYC, on Sunday, September 21. I’m excited to have the opportunity to tell the world leaders who will be convening at the UN that now is the time to stop climate change. What is even more exciting is that this will surely be the biggest Jewish climate march ever. I have spent the last month reaching out to Jews across the country as we lay plans to march together. I am confident that we will start the new year with a big bang: We’re going to be coming out in force, with our shofars blasting. The People’s Climate March is taking place just a few days before we celebrate Rosh Hashanah. To me, there could not be a better way to prepare for the new Jewish year. Rosh Hashanah is “hayom harat olam,” the day the earth was born. It is the most universal of Jewish holidays. Unlike Passover and Hanukkah (to name just two), Rosh Hashanah is not about our particular Jewish story. It calls on us to reflect on our relationship to the earth that we share with everyone else. In recognition of Rosh Hashanah the Jewish contingent at the People’s Climate March will be led by 100 shofar-blowers. As a long-time activist, I have observed that we Jews tend to focus on addressing climate change on a personal level. We ask how we can use our purchasing power to make a difference. Jews across the country are making the choice to build green homes and institutions, install efficient lighting, purchase locally grown food, and reduce waste by cutting down on the use of disposable paper and plastic – all steps that save energy and reduce emissions of the greenhouse gases that are the cause of climate change. These personal and communal steps are important, and yet we cannot stop there. We need to change the system. That’s what the People’s Climate March is about. So far, despite all of the positive steps that families, faith communities, businesses, cities, and states across the US are taking, Congress has refused to pass climate-friendly legislation or support an international treaty. This is unacceptable. We need to take speedy action to switch from fossil fuels to renewable energy now. We need policies that will bring about a world safe from the ravages of climate change with good jobs, clean air, and healthy communities for everyone. 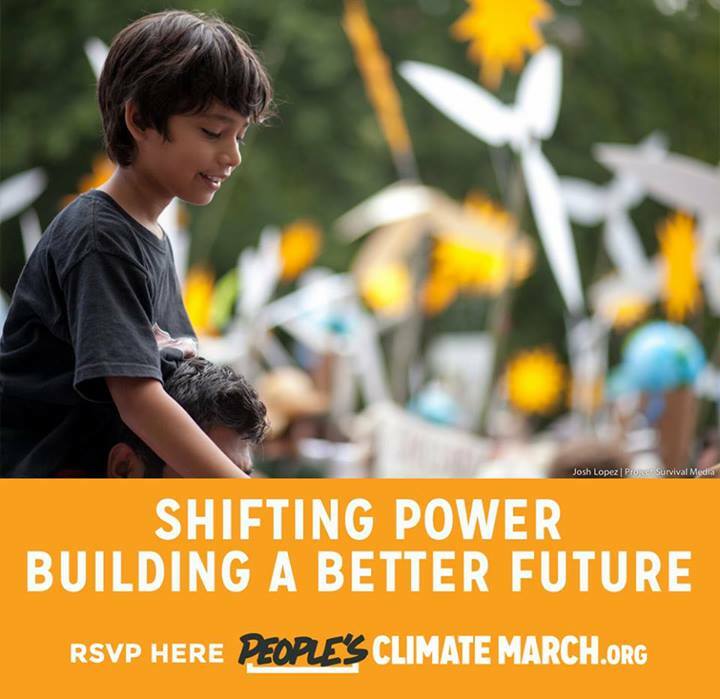 When hundreds of thousands of people come out to march on September 21, we will be showing our political leaders, and the world leaders convening at the UN, that we support them in making tough decisions for ambitious, comprehensive policies that will prevent climate change from accelerating. The sound of the shofar is a cry of pain but it also brings a message of hope. This year, by marching together, we will change the course of history. I look forward to seeing you there, shofar in hand. REGISTER TO MARCH WITH THE 14th STREET Y here and choose 14TH STREET Y from the drop down menu. The 14th Street Y is Marching in the People’s Climate March. Join Us! To change everything, we need everyone on board. It has not been easy to watch, hear, or read about the world lately. And wondering, “what can I do?” has fewer and fewer answers. Here is something you can do. Here is a tangible way to participate in the conversation, the work and the demand for action. Here is a way to move mountains one step at a time. Join your friends, your family, your neighbors , your community, faith based groups, and many, many more in the People’s Climate March. Sign up here to march with the 14th Street Y.